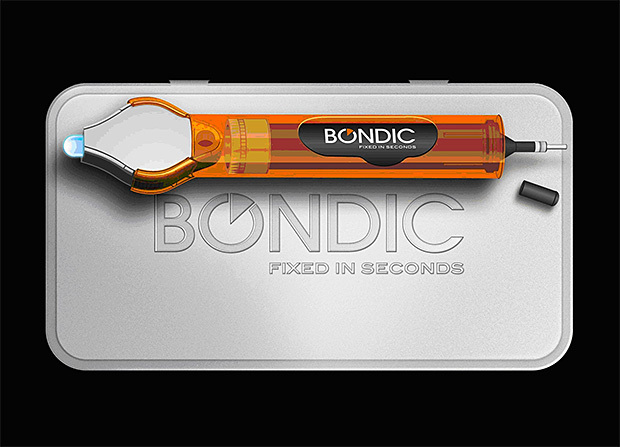 Bondic™ is The World's First Liquid Plastic Welder | OhGizmo! By David Ponce on 12/04/14 • Leave a comment! This is a seriously cool product. It’s a stick that contains a special resin that remains liquid until you zap it with the included ultraviolet light. When that happens, it hardens within 4 seconds. In other words, Bondic allows you to play around with your broken stuff right up until the moment you need it to harden. No more stressing out that your glue is going to harden before you’ve had time to place things in the shape you want, simply because Bondic is not glue: if you don’t zap it with the UV light, it won’t harden, period. It’s $22 for a stick, and $12 for a refill cartridge.